After reading VENOM #36, I felt it was a good time to setup another interview with Cullen Bunn to see where he plans on taking the series. A couple days after he agreed, Mania was announced. This led to an onslaught of interviews including ones from ReadComicBooks, ComicBookResources, and Newsarama. However, Cullen decided to save the best site for last! TVS: Once again thank you for setting aside some time to answer our VENOM questions. I really do admire how much you interact with your fans. Cullen: Thanks to you and the fans for taking the time to talk with me! Let's start with the exciting news from last week's September's solicitations, namely that Venom is getting his own symbiote sidekick, Mania. How did Mania come about? Did you always intend to create another symbiote when you took over the series? When I took over VENOM from Rick Remender, I put together a long outline (a couple of years worth of stories) for what I had in mind. Part of that outline included the introduction of a new symbiote-powered character. The outline has been changed and blown up over and over again for various reasons, but there were bits and pieces that carried over. The introduction of Mania is one of those pieces. The original plan was quite different, but Mania wouldn't have come about without that original kernel of an idea. She’s a natural progression from where the series… and where Flash… has been going for a while. And… keep in mind… while the Mania-focused solicit was just released, Mania shows up before issue 40. 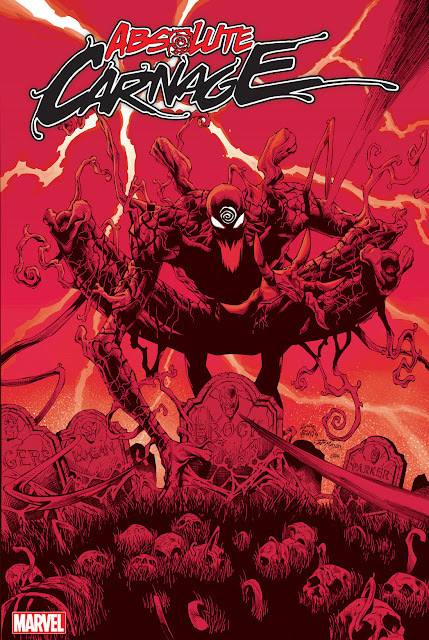 Last issue, we were introduced to Lord Ogre, a villain you created specifically for Venom. What kind of guy is Lord Ogre and why is he a good adversary for Flash? Going into issue 37, Flash is trying to establish himself as Philly’s “Dark Avenger” style superhero. He starts to build a network of contacts, begins getting his resources in order… all so he can be a more efficient hero-by-night. As I thought about this aspect of the character, I decided Venom needed a new rogue’s gallery. That’s where Lord Ogre comes in. He’s essentially the kingpin of all underground activity in Philly, and he’s established himself (among lowly criminal types) as this kind of religious figure—a holy man of crime. He’s also surrounded himself with a cadre of sinister, strange characters. 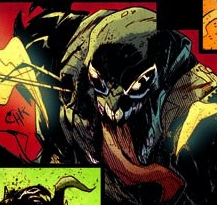 Lord Ogre is really a driving force for change in Venom’s life. Early on, he sets the dogs of war on Venom’s trail. These “dogs” include a host of assassins. And this has a domino effect that leads to the creation of Mania. Since taking over the series on issue 23, you have slowly been building up a decent size supporting cast for Venom – Katy Kiernan, Valkyrie, Damien Hellstrom, 'The Demon', Monsters of Evil, U-Foes, Eddie Brock/Toxin, Lord Ogre, Mania. Are you planning to continue to build up VENOM's roster or will we see some of his supporting cast resurface and maybe cross paths with one another? Both! Many supporting cast members will be resurfacing or taking on more important roles. Katy, Mania, and Hellstrom all have important roles to play in the next few issues. You’ll see the Monsters of Evil again, too, as I wrap up some of the story lines they’re associated with. I’ll also be adding some new characters to the cast… mostly in minor roles… especially as Venom starts building his foundation of allies in his war against Philly’s crime lord. How far down the road do you have VENOM mapped out? Are there any upcoming stories you are particularly excited about? Like I said, I created a long outline for the series. The outline features phrases like “Project: Rebirth,” “Anti-Venom,” “Toxin,” “the Descent,” “War for the Symbiote,” “Crime-Master,” etc… all elements I like a great deal. But that outline changed from the beginning, and many of those elements have shifted and been put on hold. There are so many stories I’d love to tell. For now, I’m still most excited about the next 6 issues or so, which feature the origin of Mania and the return of Jack O’Lantern. We are slowly approaching VENOM's 50th issue milestone; do you have anything special planned if when the series hits that magic number? Every interview needs one “wait and see” answer, right? Well, this is it. There are big things in Venom’s future. Finally, it seems as though many fans are quite fond of Scorn and want to know if you have any plans for her whether in VENOM or your FEARLESS DEFENDERS series? The interesting thing about Scorn (and I’ve been thinking about it a lot) is that her origin and current standing in the Marvel Universe means (for me, at least) that she needs a very specific story in order to work. I do, however, see her having a place in a book like FEARLESS DEFENDERS. That book is intended to showcase underused female characters, and she fits the bill. Fan Questions: WolfCyper: Since taking over Venom what has been your favorite arc to work on so far? I think the Toxin arc has been my favorite. I typically think in 5 or 6 issue arcs when developing stories. That’s the story length I prefer. But most of the arcs in Venom have been 3 issues in length because of crossovers or changing artists, etc. With the Toxin arc I was able to take my time with the story… and it didn’t hurt that I was able to write a kickass symbiote brawl. Luis Jimenez: What do you use to inspire your crazy awesome stories? Do you blast music or do some hobby before settling down to write it? I dunno where this stuff comes from! I don’t really have a ritual when I sit down to write (and I rarely listen to music while writing). Sometimes I’ll read some comics (old and new) that I love just to get me blood pumping. Jamie Eccleston: Now that the amazing Toxic arc has finished, do you have any thoughts on Eddie and Toxin's future? I think Eddie has a role to play as a major anti-hero in the Marvel Universe. I’d love to see him play the role of Toxin for a long while, even taking center-stage. While my heart never melted for the previous “Lethal Protector” phase of Eddie Brock, I think a modern take on that aspect of his life might be kind of awesome. Thanks again to Cullen for taking the time out of his busy schedule to entertain our questions!